Edge of the Center: JACK Quartet, Eric Huebner, Jonathan Golove, Talujon, kick off opening weekend of June in Buffalo 2013! JACK Quartet, Eric Huebner, Jonathan Golove, Talujon, kick off opening weekend of June in Buffalo 2013! We’re looking forward to the opening weekend of June in Buffalo 2013! 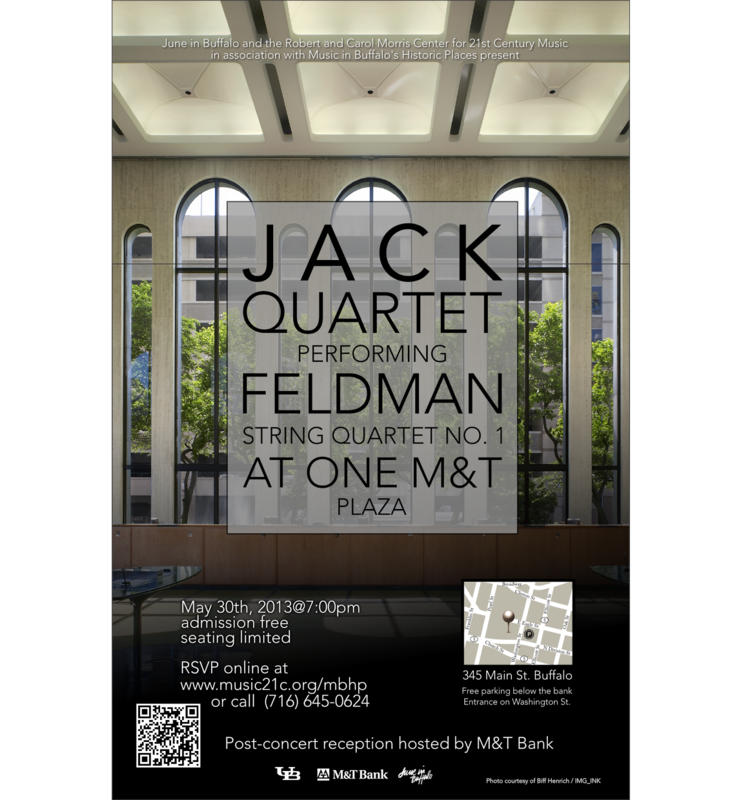 The festival will kick off with a concert by the JACK Quartet on Thursday, May 30, at 6:30 p.m., at One M&T Plaza, a special historical building in downtown Buffalo which was designed and built in 1966 by Minoru Yamasaki, the architect for the World Trade Center in New York City. In addition to opening JiB 2013, the concert is also part of the Center for 21st Century Music’s Music in Buffalo’s Historic Places series (more on the event and the series here), and will open with a brief presentation by UB Professor of Architecture, Brian Carter, who recently published M&T Bank, a book detailing the history and design of the building. 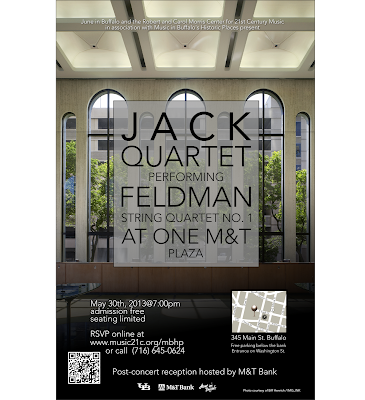 The concert, which starts at 7:00 p.m., will consist entirely of Morton Feldman’s String Quartet No. 1, performed by the JACK Quartet. There will be a nice reception with wine and light snacks before the concert, hosted by M&T Bank, and it’s likely the concert will sell out, so we recommend you RSVP. 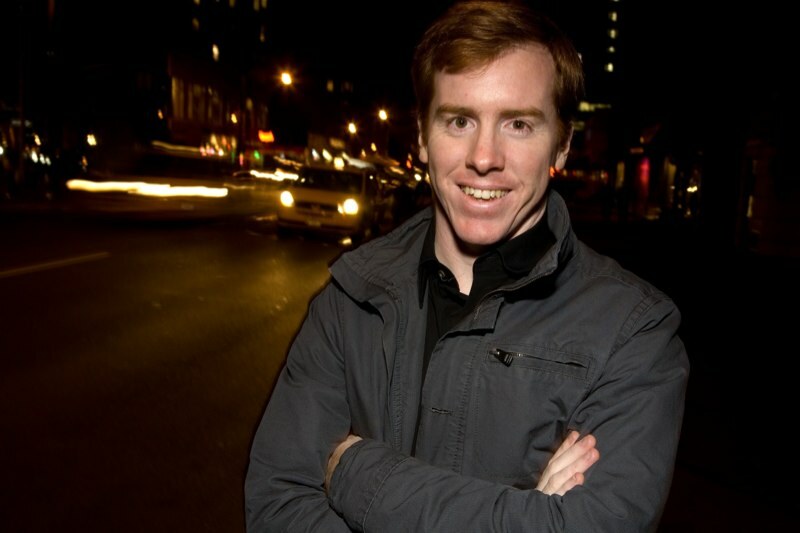 The concert on the following day will be held here at UB in Slee Hall on Friday, May 31st, at 7:30 p.m., and will feature soloists Eric Huebner on piano, and Jonathan Golove on cello and Theremin cello. The program will include Iannis Xenakis' Kottos for solo cello (1977), Roger Reynolds' imAge/E and imagE/E (2007), Edgard Varése's Density 21.5 (1936, revised 1946) arranged for Theremin cello by Jonathan Golove, the world premiere of Eric Wubbels' Psychomechanochronometer (2013), which was commissioned with support from the Mikhashoff Trust for New Music, Elliott Carter's Sonata for cello and piano (1948), and some selections from György Ligeti's Études (1985-94). Saturday, June 1st, boasts another concert of virtuosic contemporary music in Slee Hall, this time performed by the Talujon Ensemble. Their concert will feature Brian Ferneyhough's Fanfare for Klaus Huber (1987), Charles Wuorinen's Marimba Variations (2012), Marc Mellits' Gravity (2013), Ross Bauer's Echometry (2013), and Iannis Xenakis' Okho (1989). RSVP here for the inauguration of the June in Buffalo Performance Institute on Thursday, May 30th, at 6:30 p.m., with the JACK Quartet -- we'll be keeping everyone updated on June in Buffalo 2013 at the Center for 21st Century Music, as well as through facebook and twitter. Also, stay tuned for more on our finale concert on Sunday, June 9th, at 2:30 p.m. with the Buffalo Philharmonic Orchestra, under the baton of JoAnn Falletta, with pianist Geoffrey Burleson, featuring the work of JiB faculty composers at the University of Buffalo in Slee Hall.